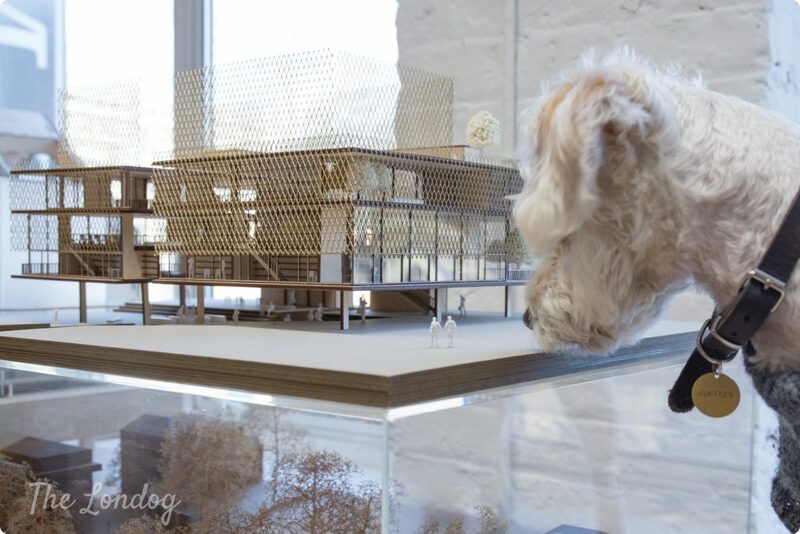 When I step into Architecture 00, a RIBA award winning studio in East London, I find little studio dog Jake giving proof of his acrobatic skills. He is attempting to jump and catch a broom Lynton has just used to clean up some earth that spilled from a plant pot. 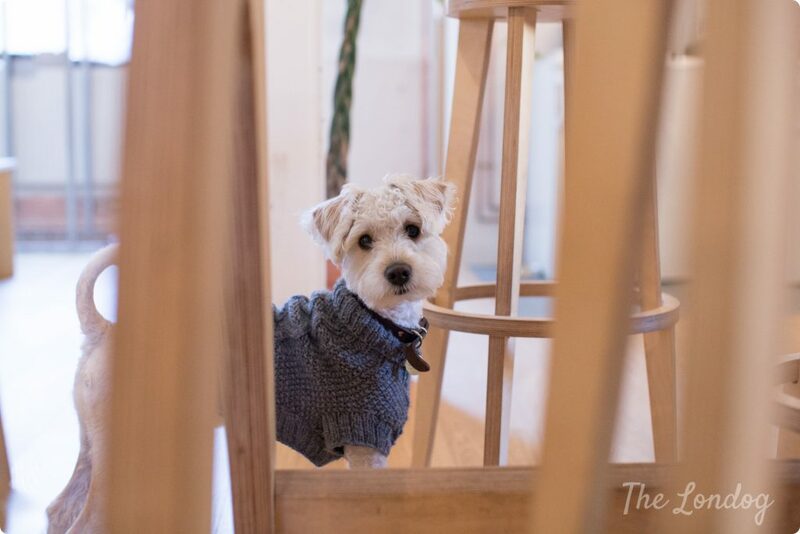 He trots around, only to notice that somebody is busy doing another more interesting activity in the kitchen, and disappears behind the long legs of a table. 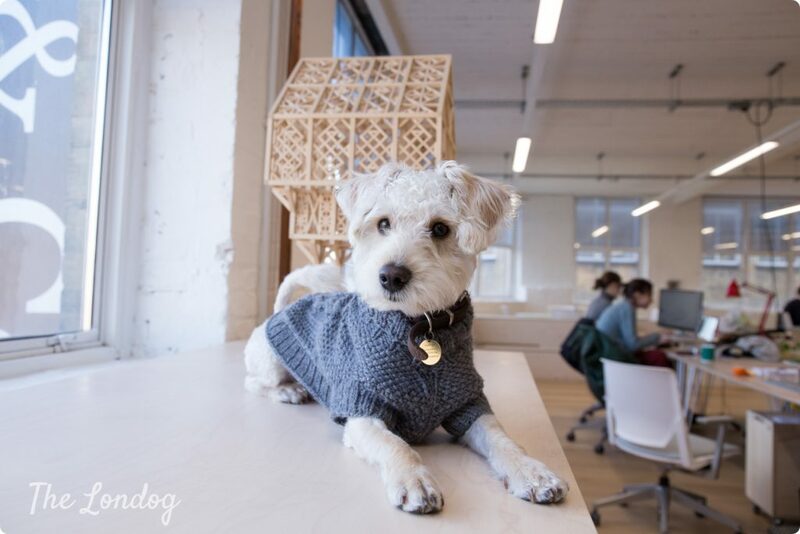 Jake, who is a one-year old Schnoodle, became Architecture 00’s studio dog as a 12-week old puppy. 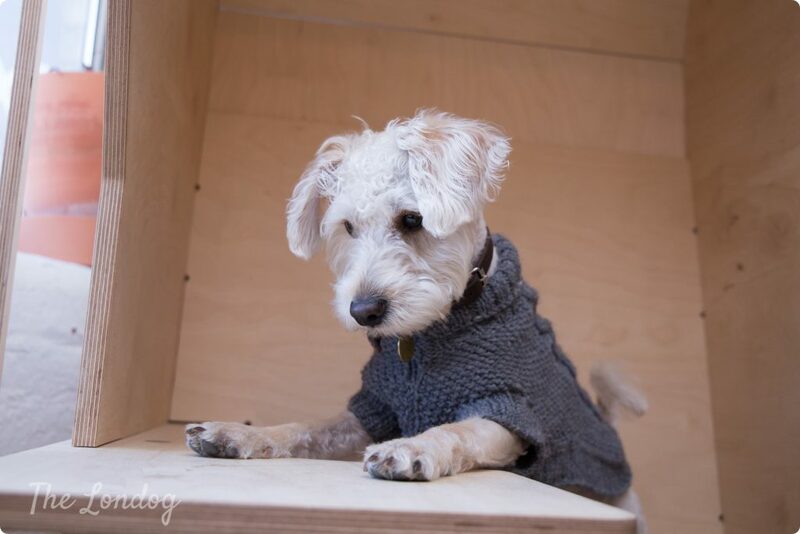 When I meet him, he is wearing a grey knitted wool jumper, which adds to his already endearing looks. 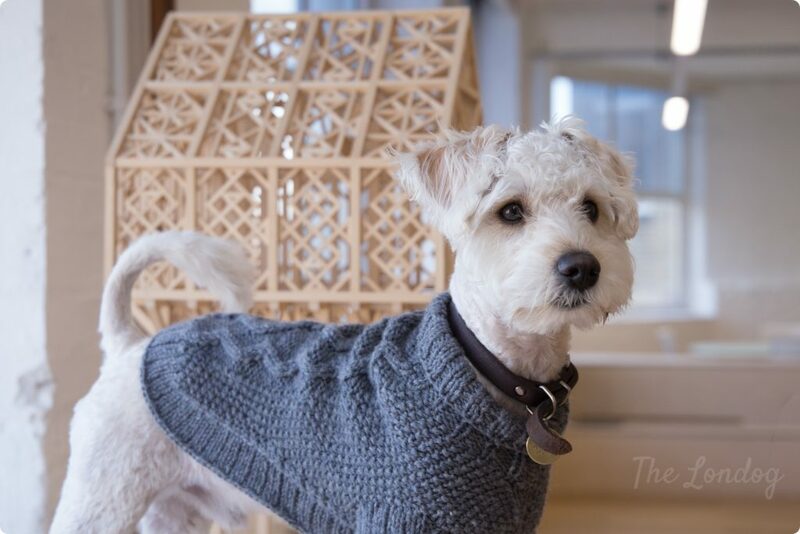 “He’s recently had a massive haircut and now has to wear [that] knitted jumper, which he is terribly fond of”, says his owner, Lynton Pepper, architect and co-founder of Architecture 00. “He started off completely white, then went on to grow a ginger stripe down his back and now has settled on ginger tinged feet. Jake is very friendly and people love having him around”. 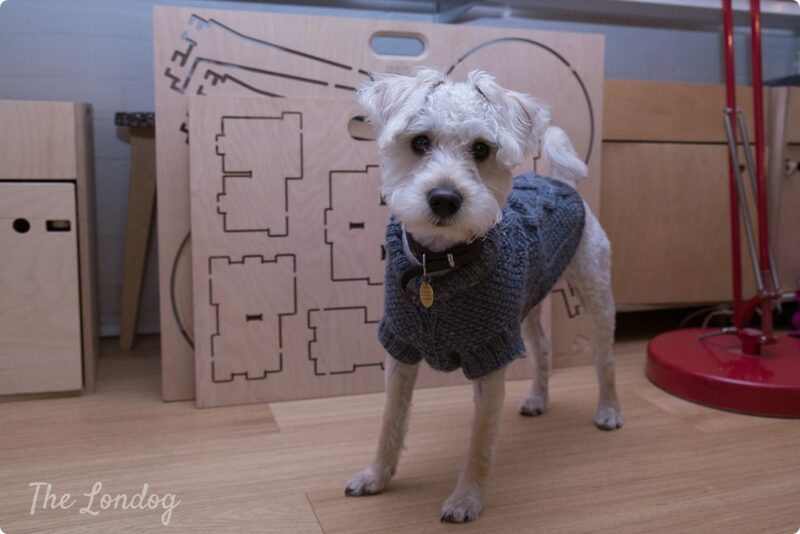 Although he is said to be funny, silly and 12/10, Jake is a very smart little doggie. You can’t imagine how fast he works out that ‘stay’ means being given treats during our shoot, and Lynton is also impressed to see him doing so well. Loving: Snacks, playing pull, and running around Hackney Downs and London Fields. Hating: When wind blows on his bottom. His funniest habit: Whipping his head around quickly and looking bemused if you blow on him. Most annoying habit: Unexpectedly licking you when you’re not looking. His most famous episode: Slipping off a chair at the precise moment someone gave some big news in the office. Architecture 00 shares the floor and office with Opendesk, a global furniture platform for local making, and all the furniture at the office is in fact designed and made by Opendesk and Architecture 00. 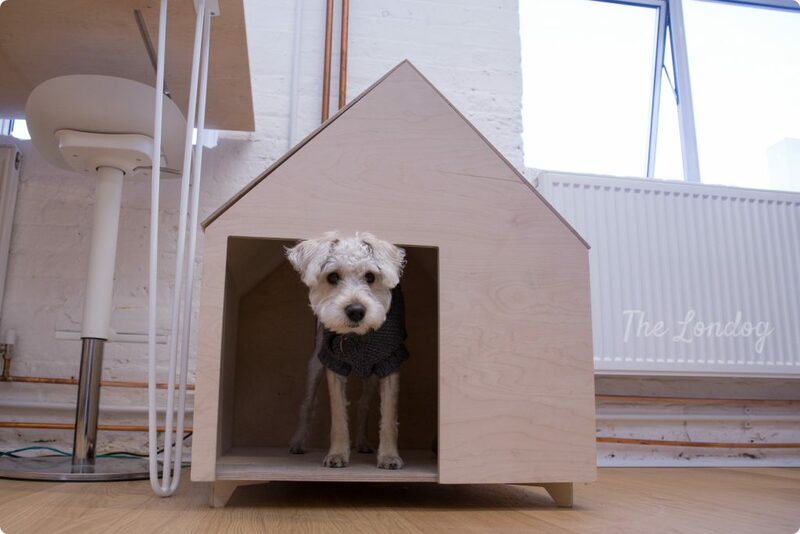 One of the perks of being the office dog at the studio is getting a dog house made just for you… Jake’s little wooden house, which matches the rest of the furniture’s style, is placed near Lynton’s desk. It has a wide door and a skylight from which Jake can peek out. Lynton explains that he has now almost outgrown his dog house, so he uses it less than he used to when he was little. In his puppyhood, apart from enjoying his dog house, “Jake used to live on the desk and everyone’s favourite memory was of him sleeping under my laptop stand”, says Lynton. What he hasn’t lost, is being partial to running and playing with balls, and the studio can sometimes turn into a playground with Lynton running around following or preceding Jake in a game of chase or throwing balls. Did you enjoy Jake’s story? Stay tuned for tomorrow’s office dog story: we take you to a magazine that does not need introduction and its office dog, Macy. From 24.00am on the blog. Learn more about the Series here.